Forests are sources of multiple products and services of importance to a wide array of stakeholders, from local communities to urban citizens. In addition to contributing to human wellbeing and livelihoods, forests are important for people’s spiritual and cultural traditions. Forest tenure and property rights determine who owns and manages forest resources. Forest tenure often is very complex, as there is an array of stakeholders with different interests to forests, such as the national and local state officials, the local users, local communities and Indigenous Peoples and seasonal users. Part of this complexity can be traced back to the colonial times, when many natural resources were taken over by the state while the rights of local resource users were unrecognized. State control and management of land and forests persists in many areas today, yet these resources are claimed and managed by indigenous and local communities who base their tenure claims on community-based, customary rights that are commonly unacknowledged by states. Overlapping tenure rights often result from the co-existence of competing laws that emanate from the state and from communities. The presence of multiple groups with overlapping and simultaneous tenure claims contributes to resource conflicts. In many countries, conflicts related to tenure and property rights are so grave that they result in social conflicts and violence, as well as environmental destruction. Across the globe, rights devolution processes have transferred rights to local people and communities. These reforms have been initiated by Indigenous Peoples’ demands for the recognition of their rights, governance decentralization processes and conservation interests. In addition, commercial community forestry activities and payment for environmental schemes (PES) require clear and secure tenure; commercial activities to ensure finance and collateral, and PES schemes to identify the responsible service providers. Rights and Resources Initiative (RRI) estimates that as of 2013, Indigenous Peoples and local communities legally owned or controlled about 15.5 percent of the world’s forests, while governments claimed to control 73 percent of global forests . Looking at low and middle income countries, the share of forest land under legal community control or ownership is twice the global average, at 30 percent. While the majority of tenure reforms have taken place in the low and middle income countries, governments still claim control of at least 61 percent of the developing world’s forests . The progress of rights devolution has differed significantly across regions in terms of scope and pace of reforms. In Latin America, the progress has been most noteworthy, devolving both long-term community or group concessions and titling of Indigenous Peoples’ domains . Brazil, in particular, has demonstrated significant progress, followed by Bolivia, Honduras, Colombia and Peru. The successful devolution of rights in Latin America has been linked to the strong presence of indigenous people’s movements as well as to the shorter duration of suppressive colonial power . In Asia, countries have implemented diverse approaches to rights devolution, including recognizing more limited degrees of community control, such as co-management arrangements . Majority of the forest area under legal community ownership or control is located in China and India, but also smaller countries such as Nepal and the Philippines, have had considerable success in devolving rights to communities . Rights devolution in Africa, on the other hand, has remained stagnant, and governments still claim over 90 % of the forests. African countries that have implemented tenure reforms (e.g. Tanzania) have focused on long-term co-management agreements. Research on tenure reforms has found that reform processes are marked by policy reversals and corruption as well as slow titling processes in contested areas. The elites and more powerful actors have been able to influence and slow down reforms while capturing benefits for themselves. The processes are also characterized by competing, contradicting interests among government actors and local communities, but also by conflicts with customary users and newly created formal rights holders. Conflicting laws and regulations that result in overlapping government jurisdiction and disputes, as well as outdated and inaccurate spatial maps, exacerbate the situation . Forest tenure reforms also entails complex shifts in rights, responsibilities and relationships between different actors. The process of rights formalization is crucial, as it can either facilitate or discourage local community management. Compared to formalized tenure law and regulations that emanate from states, customary law often offers more flexibility, is better able to accommodate a broad spectrum of resource users, and is more dynamic and adaptive over time. At worst, the new legal system can undermine these customary practices and the local livelihoods that they enable, thus creating incentives for illegal and unsustainable practices . In fact, excessive and cumbersome legal regulation is one of the biggest challenges for smallholders and community forestry for achieving formal recognition as well as rights to commercial exploitation of forest products . Although some states do recognize customary laws and local norms during reform processes, in practice, customary tenure systems can be rigid, biased in favor of elites, discriminatory against women, and/or lacking in accountability mechanisms. If a society’s values and norms are underpinned by the avoidance of social discord  or patriarchy, individuals may be unwilling or unable to challenge decisions made by those in positions of authority, even when livelihoods suffer because of the resulting loss of access to land, or due to decreased incomes. The socio-economic status of community members and the existence of gender-based inequalities have significant impacts on forest access, use, and control. Inequality across socio-economic groups, castes, or genders increases the risk of conflicts, decreases the likelihood of community forestry, and increases deforestation . Strong internal community governance structures characterized by equitable leadership, decision-making, and benefit-sharing processes motivate people to engage in community forestry activities . The existence of income-generating activities that create material benefits for communities and that incentivize forest conservation . As suggested above, a range of contextual factors, such as the duration of statutorily recognized rights, government support for laws and regulations, and the capacity of rights holders to exercise the rights, affect tenure security. For example, researchers often use the concept of people’s perception of tenure security to account for the impacts of land rights that extend beyond the issuance of legal titles and statutory rights. This approach captures relationships between tenure and social factors such as rights holders’ role within social networks and their larger position within a community . State support and protection is especially crucial for communities’ ability to exercise their rights. Some states(e.g. Ghana, Mozambique and Tanzania) have constitutional, policy and legislative provisions to safeguard customary rights to forest and land, but customary rights have remained inadequately protected in the negotiations for large scale land acquisitions. Huge tracts of customary land have been lost in many parts of sub-Saharan Africa, often permanently and with limited compensation, because of inadequate support from the government to secure rights, lack of policy enforcement and implementation monitoring as well as weak community consultations . Increasingly, forests are considered an essential part of the wider agenda on sustainable development, and their role is highlighted by international initiatives, such as REDD+, the New York Declaration on Forests and EU’s Forest Law Enforcement, Governance and Trade (FLEGT) Action Plan. Sustainable Development Goal 15 highlights the need for sustainable forest management, as it calls to “protect, restore and promote sustainable use of terrestrial ecosystems, sustainably manage forests, combat desertification, and halt and reverse land degradation and halt biodiversity loss.” Furthermore, The Voluntary Guidelines on the Responsible Governance of Tenure, which set out principles, technical recommendations and practices for improving the governance of tenure of land, fisheries and forests, are gaining momentum at the country level. These guidelines have enabled increased political commitment, improved policies and legal frameworks and supported evidence-based decision making. These initiatives contribute to the goal of reduced deforestation through different means such as strengthening incentives for forest protection, improving forest governance and supporting the restoration of degraded lands. For the success of these initiatives, clarifying forest tenure, enhancing the equity in property rights and inclusive participation in decision-making are crucial. These initiatives are likely to have different priorities regarding forest tenure, such as formalizing existing rights with legal title or excluding illegal loggers from supply chains. For compensatory schemes such as REDD+, secure legal rights are crucial, especially if legal rights are a prerequisite for participation. In addition, the forests that REDD+ aims to protect can be claimed by external claimants such as the neighboring villagers, seasonal migrants and industrial enterprises of various kinds (e.g. soy in Brazil and oil palm in Indonesia) and enforceable rights form a legal basis for the exclusion of external claimants . Other initiatives, such as FLEGT, highlight the need to tackle illegal logging in order to reduce deforestation. Due to the fundamental discrepancies between statutory and customary law, “illegal logger” can mean different things in state and customary law. If illegal logging is defined as “the harvesting of timber in contravention of the laws and regulations of the country” , informal customary tree harvesting and customary will also be sanctioned. For example, in the Democratic Republic of Congo and Cameroon, informal logging sector forms an important part of the timber markets. Informal logging is based on customary rules and commercial sales of logs are socially approved, but sanctioned by formal state law. Attempts to formalize the informal small scale logging have met resistance, both from corrupt government officials benefiting from informal trade as well as loggers for whom remaining within the informal sector is an easier and more feasible option compared to legalization. The problem is further exacerbated by poor law enforcement and lack of sanctions for noncompliance with the statutory law . Women often have more limited opportunities to participate in resource management, which is partly affected by social and cultural norms. Typically, men are responsible for hunting and harvesting of timber, whereas women collect the majority of forest products for food and medicine . Physical constraints are not the only explanation for these patterns, because the withdrawal, preparation, and sale of certain high-value forest products (such as timber) are seen as male-only activities . Tenure rights, inequitable gender norms, and social realities such as women’s low literacy rates also limit women’s participation in product value chains, such as the processing and transportation of the goods to markets . Moreover, some statutory laws and regulations create barriers for women’s tenure rights by favoring male heirs or paying inadequate attention to imbalanced power relations between spouses (e.g., in terms of requirements for selling jointly managed family land) . A number of obstacles restrict women’s ability to participate in community-level decision making processes. Community attitudes towards women’s participation can be dismissive, and women are usually not expected or allowed to participate in community-level decision making . Efforts aiming to create opportunities for women to participate in decisions about community forestry are not always successful, and much work is yet to be done to safeguard the governance rights of indigenous and local women. For example, in India, the Forest Rights Act, 2006 sets a quota for membership of women on village forest committees. However due to patriarchal governance structures within customary tenure systems these quotas ultimately didn’t empower the women from lower social classes to participate in decision making . Furthermore, if traditional gender roles in the community prevent the sharing of domestic work, participation in community decision-making can be too costly for women, many of whom cannot afford or have not time to assume additional responsibilities. Finally, some indigenous and local women who actively try to participate report that men in the community often overlook their demands and opinions . Forest and land tenure refers to the social relations and to the institutions governing access to and use of forest and land resources. These relations and institutions shape and form the rights and rules over the resource use, including who owns the resource, and who can use, manage and make decisions about the resource. The term “property rights” is often used interchangeably with forest and land tenure. Property rights refer to the rights that individuals, groups and the state hold with respect to particular land, resources and other assets, and in relation to each other . 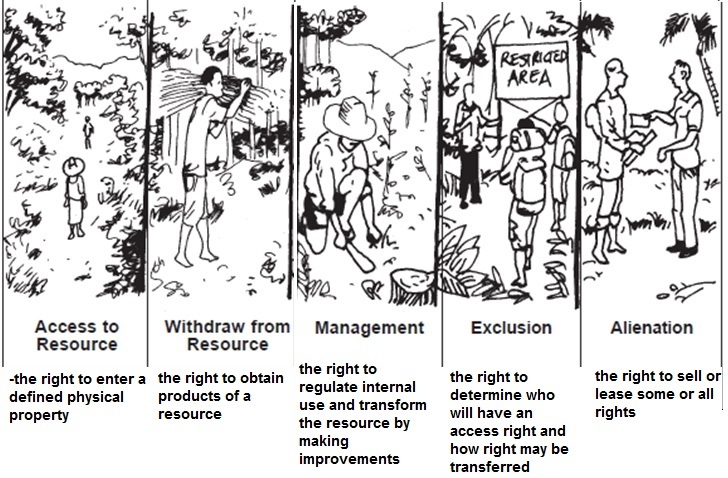 Property rights should not be regarded only in terms of ownership, but rather understood as overlapping “bundles” of rights, consisting of rights of access, rights to use products from the resource, rights to make management decisions, rights to exclude other users, and rights to sell or lease the land or the right itself . Sunderlin 2011. The global forest tenure transition: Background, Substance &Prospects. In Sikor & Stahl: Forests and People: Property, Governance, and Human Rights. Laird et al 2010. Bringing together customary and statutory systems: The struggle to develop a legal and policy framework for ntfps in Cameroon bt - wild product governance: Finding policies that work for non-timber forest products. Larson & Pulhin 2012. Enhancing Forest Tenure Reforms Through More Responsive Regulations. Laumonier and Sasaoka. 2012. Suitability of local resource management practices based on supernatural enforcement mechanisms in the local social-cultural context. Cronkleton P & Larson A.2015. Formalization and Collective Appropriation of Space on Forest Frontiers: Comparing Communal and Individual Property Systems in the Peruvian and Ecuadoran Amazon. Sunderland et al 2014. Challenging Perceptions about Men, Women, and Forest Product Use: A Global Comparative Study. World Development Vol. 64, pp. S56–S66. Banana, AY, Bukenya M, Arinaitwe E, Birabwa B, and Ssekindi S. 2012. Gender, tenure and community forests in uganda. CIFOR Working Paper, (87):36 pp. Ingram et al 2016. Gender and forest, tree and agroforestry value chain. In: Gender and Forests: Climate change, tenure, value chains and emerging issues. Edited by Colfer C., Sijapati Basnett B & Elias M. Earthscan Routledge. Mukasa, C, Mango A, and Muloki HN. 2012. Gender and forestry in uganda: Policy, legal and institutional frameworks. Bose, P. 2011. Forest tenure reform: Exclusion of tribal women's rights in semi-arid rajasthan, india.International Forestry Review no. 13 (2):220-232. doi: 10.1505/146554811797406615. Mairena, E, Lorio G, Hernández X, Wilson C, Müller P, and Larson AM. 2012. Gender and forests in Nicaragua’s indigenous territories: From national policy to local practice.